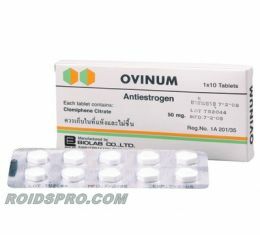 In our shop we offer and sale highest quality Clomid PCT tablets such as Ovinum. Here you can find highest quality brands of Clomifene such as: Meditech Pharmaceutcals, Biolab and Global Anabolic. Clomid aka Clomiphene is very popular Post cycle treatment tablets which block estrogen receptors and is one of the most popular anti-estrogen for bodybuilding. Clomid also stimulates ovulation in woman and using to get pregnant. On the other side Clomid used in bodybuilding helps to block estrogen receptor in brain, in general Clomid also stimulates increasing of natural testosterone so that helps to retain muscle mass and libido as well. Clomiphene pills can cause some side effects such as: nausea, vomiting, diarrhea and flushing. 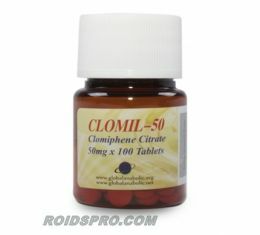 Buy real and legit Clomid (Clomifene 50 mg x 10 capsules) Meditech Pharmaceuticals Packaging: 50 mg per capsule x 10 caps per bottle Substance: Clomifene ..
Buy legit and real Ovinum for PCT (Clomiphene Citrate - Clomid 50 mg x 10 tablets) BIOLAB Packaging: 50 mg per tablet x 10 tablets per box Substance" Clomiphene Citrate ..